Dynamo’s Registered Service Partner program is the fasted way to get into the power business and support a game changing product line. 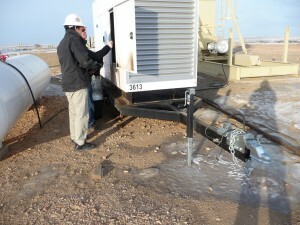 Registered Service Partners (RSP) support the commissioning, service and field support of Dynamo products. If you meet the criteria and would like to apply for the Registered Service Partners program, contact us below and a dynamo representative will review your application and contact you with next steps. As an RESP, you will receive tier 1 training and support from Dynamo, so that you can help conduct site power planning, product commissioning, and support. Dynamo will also provide you with exclusive sales leads in your region. Accelerate your business with exclusive service leads direct from Dynamo. Dynamo’s engineers have developed a cutting edge power planning software which will predict the needs of your oil and gas customers; each custom proposal forecasts energy consumption and financial benefits of implementing a Dynamop product for the life of each well. Receive the training you need to get your power business started or to take your company to the next level. Attend an introductory webinar for new service partners, or participate in advanced sales and installation courses by learning about proven sales techniques and latest best practices for installing and commissioning turbine power systems. Dynamo’s equipment comes with real-time quality assurance, to ensure product performance as well as effective commissioning. This consistency of performance is a powerful testimony for oil and gas customers the world over. As the shale boom explodes across the US, the market for portable power is rapidly growing. Partners that join us now will be well positioned to grow as the oil and expands over the next two decades. If customer service, quality installation, and partnering with the best are key to your business strategy, then we want to hear from you. Where do you want to provide Service? Tell us a little about yourself or your organization.